Alien abductions are anything but otherworldly to movie lovers, with films like "Close Encounters of the Third Kind," "Communion," "Fire In the Sky" and "The X Files Movie" offering famous silver screen depictions. But the world's first widely reported alien abduction -- the case against which all other alleged E.T. kidnappings are measured -- has never hit the big screen. Bryce Zabel hopes to change that. Just in time for the 50th anniversary of the reported UFO kidnapping of Betty and Barney Hill in New Hampshire, Zabel, a former chairman of the Academy of Television Arts and Sciences (the organization that produces the Primetime Emmy Awards), has announced his intent to make the definitive movie about the Hills' experience. The film will be based on the book "Captured! The Betty and Barney Hill UFO Experience" by Stanton Friedman and Kathleen Marden. "I think, with modern filmmaking techniques, we can make a movie that will be more of a credible telling of the story," said Zabel. This is the story the Hills told: On the night of Sept. 19, 1961, they were driving south on Route 3 through the White Mountains, en route to their Portsmouth, N.H., home, when they saw a large, lighted object in the sky following them and then rapidly descending toward their car. The Hills grew frightened as the silent, circular craft loomed closer to them. Barney was especially afraid when he noticed, through binoculars, what he described as several humanoid figures standing at the windows of the mysterious craft. Fearing they were about to be captured, the Hills drove quickly away. Shortly afterward, they found themselves 35 miles farther along on the road and later realized they couldn't remember approximately two hours of time from that night. Eventually, a well-known psychiatrist and neurologist, Dr. Benjamin Simon, used a technique called regression hypnosis to help unlock the Hills' forgotten memories. Through many separate hypnotic sessions, the Hills recounted a tale of being abducted by alien beings into the UFO and given physical examinations before being returned to their car with their memories erased. "The first time I saw the occupants was a group of them standing in the highway, just prior to our capture," Betty Hill told this reporter in 1975. "As far as appearance, we described them as four-and-a-half to five feet tall, humanoid-like, very large eyes that slanted upward, very flat nose, just a thin slit for a mouth, a grayish complexion, and that they were all dressed alike. I don't think I was really prepared for their appearance -- I was terrified," Betty recalled. The most significant thing about the couple's story is that it was the first widely publicized report of alien abduction in history, filled with details. Moreover, the Hills, now deceased, were highly respected members of the New Hampshire community where they lived: Betty was a social worker and Barney had been appointed by the governor to serve on the state advisory civil rights committee. Those are among the many reasons why Zabel is making the film of their very close encounter. "Whether one agrees that abductions happen or don't happen in the UFO field, this is an important story because it's the first time the world had its focus brought to bear on the phenomenon at all," he told The Huffington Post. The Hills' story first came to light with John Fuller's 1966 New York Times best-seller, "The Interrupted Journey," followed in 1975 by an NBC TV movie, "The UFO Incident." For the pilot episode of his 1996 NBC alien conspiracy series, "Dark Skies," Zabel featured a dramatized segment about the Hills. "I've always been interested in the case and to see that, as time has gone on, it's been a continuing story. And Kathy Marden and Stanton Friedman's involvement with it has certainly pushed the boundaries of the story even further," Zabel said. "It was a case that was very thoroughly investigated by top-notch investigators. And what's very important was that Betty and Barney both had conscious recall of the experience, except for the UFO abduction itself," said Marden, a social scientist who is also the Hills' niece. "There have been many misleading statements in the mainstream media about what Betty and Barney actually remembered. "The public was under the impression that Betty and Barney observed only a light in the sky, but those familiar with the case know that they observed much more," Marden said. "While their story has been challenged over and over again, nobody has been able to officially debunk it." Indeed, one of the overlooked aspects of this case is that at approximately the same time as the Hills said they had their UFO sighting in the White Mountains, Pease Air Force Base in Portsmouth confirmed that radar had picked up a UFO in the mountains. Skeptics point out that the Air Force concluded the UFO was simply a weather balloon. During hypnotherapy, Betty stated that while they were on board the spacecraft, she communicated with a being who she concluded was the "leader" of the alien abductors, and she asked where they had come from. He reportedly showed her a three-dimensional map that included many stars with lines connecting several of them. "It was almost like looking out a window at night and seeing the stars," Betty said in 1975. "And he asked me if I knew where we were on the map, which I did not know, and so he said that he could not identify the map to me because I didn't have the knowledge. But he did say that there were certain lines on the map which were places they went frequently, places they went occasionally and expeditions." 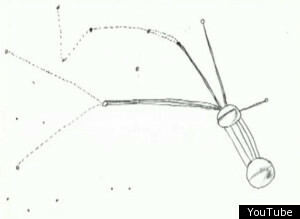 In 1964, under hypnosis, Betty drew the "star map" (left). When the Hills' story was eventually made public, an Ohio schoolteacher and amateur astronomer, Marjorie Fish, spent several years studying multiple viewpoints of nearby sunlike stars and found a possible match to Betty's star map. Fish's interpretation of the map was created from the viewpoint of a double star system called Zeta Reticuli. "Zeta 1 and Zeta 2 Reticuli are only 39.3 light-years away, and are a billion years older than our sun, and are the closest-to-each-other pair of sunlike stars in our entire local neighborhood," said Friedman, a former nuclear physicist. "So, from a planet around one, looking at the other, you can easily see the other star all day long, and with that billion years, you have far more incentive to develop interstellar travel because you've got a next-door neighbor," Friedman said. "The star map is important because it puts the focus on a unique place that nobody had ever talked about before and also because it's just down the street," he added. "People talk about how aliens must be coming from other galaxies -- that's hogwash! We're talking 39 light-years. There's 1,000 stars within 55 light-years." 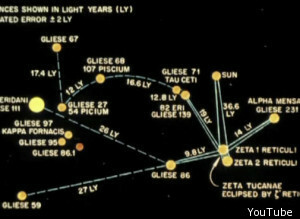 Skeptics have often suggested that Betty Hill's star map shows merely a random grouping of stars, with no other significance. Friedman has spent decades examining the star map evidence and many other aspects of the Hills' story that, he says, add up to a wealth of credible details. "There was no model for this case, so nobody could say the Hills were copying another story, because there hadn't been one that we'd heard about prior to their case," he said. In July, New Hampshire erected a historic highway marker to commemorate the 50th anniversary of the Hills' reported close encounter with aliens, and this coming weekend, the Indian Head Resort on Route 3 in Lincoln, N.H., will unveil a special plaque honoring the Hills' memory. At the latter event, Marden will conduct a tour of the Hills' original route, including a stop at the site where the Hills said the aliens abducted them. 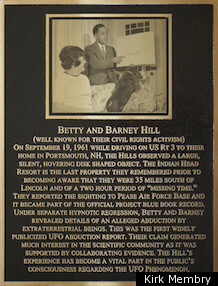 She and Friedman will also give presentations about the Betty and Barney Hill case at Indian Head, which was one of the last places the Hills consciously recalled seeing during their fateful drive that night. "There's a lot more to know about their story, and I'm going to take the close encounter tour over the weekend," said Indian Head resort owner Peter Spanos. "It was the first reported and documented UFO abduction in the U.S., and it's fascinating to me that the Hills both came up with the same story independently under hypnosis -- parts of the story that they didn't consciously know about." On September 19, 1961, while driving on US Rt 3 to their home in Portsmouth, NH, the Hills observed a large, silent, hovering disk-shaped object. The Indian Head resort is the last property they remembered prior to becoming aware that they were 35 miles south of Lincoln and of a two-hour period of "missing time." ... Their claim generated much interest in the scientific community as it was supported by collaborating evidence. The Hills' experience has become a vital part in the public's consciousness regarding the UFO phenomenon. Filmmaker-producer Zabel called the Hills' story a classic in the field of UFO reports. "Skeptics will always debunk everything. There are a lot of people who are very vested in being skeptics, and, frankly, we live in a world where we do need some skeptics," Zabel acknowledged. "And I welcome the skeptics to come in and debate the Betty and Barney Hill case. Let's get all the facts out there and get everybody talking about it."